Neil Hamilton and wife Christine [Image: Getty Images]. 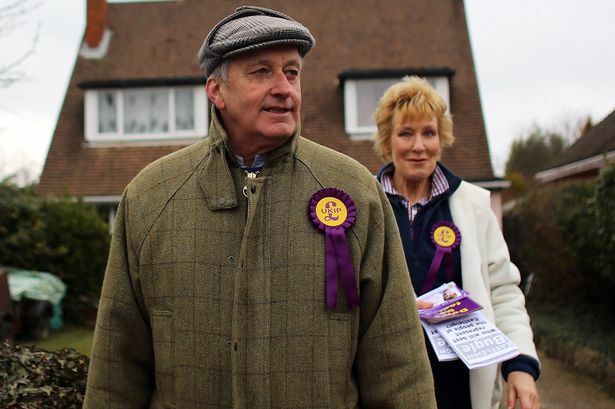 UKIP’s Deputy Chairman and potential parliamentary UKIP candidate for Basildon – the former disgraced Tory MP Neil Hamilton – clearly hates the NHS. In an extraordinary tirade of hate against the NHS in a column for the Daily Express last year, Hamilton describes the NHS as…. And what is Hamilton’s ‘cure’ for the NHS? Well if his cure is the same as cure the NHS’ it will be to give the government of all hues the excuse for more closures and delivering a worse and more dangerous NHS. This is of course as you say ex tory Neil Hamilton’s personal viewpoint not the view of UKIP. It’s the view of UKIP’s leader and of many within the party – as it is the view of many within the Conservatives who say they support the NHS but have chosen to do everything they can to harm it. Hamilton is corrupt as they come. Who listens to this loathsome specimen anyway? Tory rejects end up in UKIP, what a surprise.